In this monthâ€™s insight into our work for our clients, we take a look at the impact something simple, like clear and helpful calls-to-action, can make to the success of a single piece of content. Keep reading to see how we took a useful piece of content and turned it into something that directly made our client money as a result. 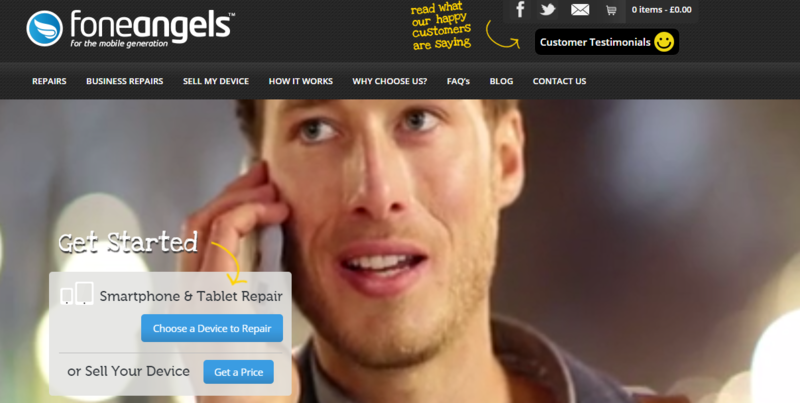 Fone Angels are a UK-based smartphone and tablet repair company, providing bespoke repair and part replacement solutions. For example, if you drop your phone and smash its screen, Fone Angels are on hand to replace the screen and get it working as good as new. They also deal with things like non-working batteries, water damage and broken components. All the sales are made through their e-commerce platform; customers select which types of repairs are needed for their device, pay online and send off their phone or tablet. You can view the full post on the Fone Angelsâ€™ site here. 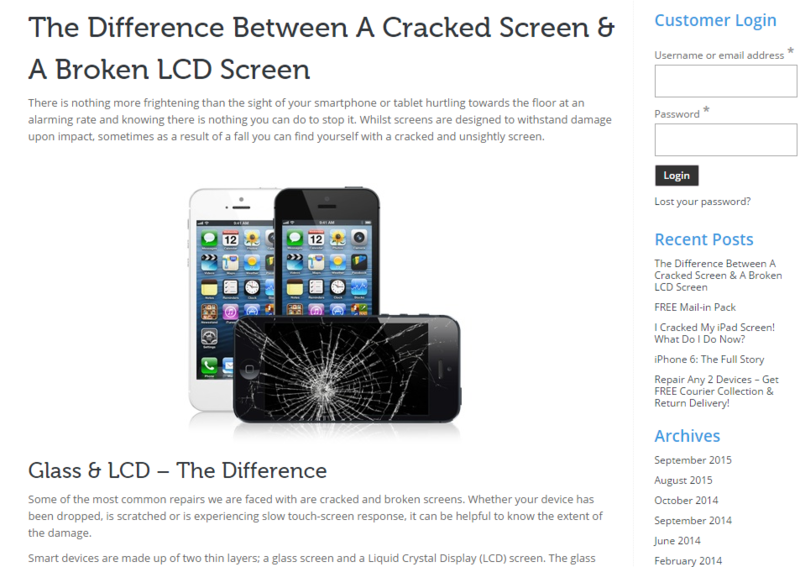 What we had to start with was a pretty straightforward piece of content; the answer to the question is concise and not particularly complicated so initially the post only consisted of the difference between a phoneâ€™s glass screen and the actual LED display underneath, and then advice on what to look out for. Already this post had a lot of views and a strong time on page, but the visitors werenâ€™t really doing anything; the bounce rate was high and conversions were non-existent. The aim from simply â€˜sprucing upâ€™ this piece of content was to create stronger and clearer calls-to-action to their repair pages, but without being so imposing as to put visitors off. The visitors the post was drawing in were those already in the predicament of their phoneâ€™s screen being broken, them not know exactly how bad it is and (most importantly) in desperate need of a solution to fix it! In short, our aim was to turn this piece of content into something to convert. We didnâ€™t want to change the content that the client had written too much, as it was bringing in visitors and it was keeping people on the site long enough to see that they were reading the piece. With the aim in mind, we knew we needed to focus on tidying up the content somewhat (creating clearer sectioning of different questions, adding in a visual element) as well as creating strong and effective calls-to-action. At this point weâ€™ve given the visitors what theyâ€™re looking for â€“ the difference between a cracking top screen and a broken LED display. With this in mind, a lot of these visitors will be searching for this as they are experiencing this issue â€“ so they need a solution. After tweaking the formatting of the initial post, we finished by having our Tech Team style up some simple call-to-action buttons at the bottom of the post â€“ one for Apple repairs, and the other for Samsung repairs. We then put event tracking on these, with separate labels to distinguish Apple clicks from Samsung clicks. We were looking to create something that stands out much more than simple text-based links where the anchor text is midway through a sentence. The wording was also quite important â€“ something too punchy or intrusive like â€œBUY NOWâ€ will instantly put people off. Theyâ€™ve got a question they want answering, theyâ€™re not immediately looking to buy something â€“ or at the very least donâ€™t want to be pushed into doing so. â€œStart your repairâ€ was what we thought would be the most effective way to funnel users through to an actual service page; itâ€™s more of a helpful guide rather than a stern command. The results of the content since we made our changes clearly show the importance of those calls-to-action and how theyâ€™re presented, in terms of turning what is already a useful piece of content for visitors into something thatâ€™s also useful for a business. With a click-through rate of just under 10%, and over Â£1,500 of direct conversions in less than three months, this post now has a direct effect on a visitorâ€™s journey. Weâ€™ve funnelled them in the direction of not just an answer to their question, but also directly into a solution to the initial problem that sparked the search in the first place. The return on this for the client was very significant; the time involved to develop this piece of content into what it is now was minimal (a couple of hours at the very most) but the results were incredibly successful. If youâ€™re in need of inspiration on how to make the most of your marketing campaigns in many other ways, just take a look at the rest of our Advice Centre. Alternatively, you can jump onto our SEO product page to get in touch with us about maximising your businessâ€™s marketing.